“There's Plenty of Room at the Bottom” - Said Richard Feynman in his famous 1959 talk to the American Physical Society, which is nowadays regarded as a first reference to nanotechnology. But what exactly the famous physicist had in mind? - In essence, control and fabrication of materials and devices at atomic and nano scale. And what do we need for that? - Mechanical systems that have active parts with a size and precision similar to that of the products they make. Moreover, they also must move with the atomic/nano scale precision and be stable enough to perform the work long enough that their own fabrication (by other nano machines!) make economic sense. Sounds like a tough problem, doesn't it? Well, at least the basic idea of nanomachines that make things (productive nanosystems) is simple: to assemble precise, intricate structures by bringing molecules or other atomic scale objects together using direct, mechanical control. They should exclude unwanted molecular encounters while ensuring that desired encounters occur with a positional accuracy of ~0.1 nm. Although based on the same molecular physics as solution-phase synthesis (in which molecular motion is uncontrolled), this approach offers far more control and reliability. Organic synthesis can make small structures with atomic precision, but it can rarely extend this precise control beyond hundreds of atoms. Nature demonstrates productive nanosystems of a sort. For example, ribosomes, found in every cell, work as digitally controlled machine tools. They read genetic information (six bits per codon) and use it to direct the assembly of sequences of amino acids. The resulting polymers, linked by bonds like those in nylon, fold to make nanometre scale objects with precise arrangements of atoms. These objects are as strong and stiff as common polymeric engineering materials, such as epoxy, polystyrene and wood. Together with nucleic acids (made by other programmable machines) these molecular objects form the working parts of a wide range of molecular machines, including ribosomes themselves. This example immediately indicates the immense productive potential of nanosystems: working as parts of larger systems of molecular machinery, ribosomes make billions of tonnes per year of atomically precise products, and they do so cleanly and inexpensively, using common raw materials. How far beyond the biological model can this technology go? Well, let's what have we done with designing computers, which nowadays have parts 100 times smaller that the thicknes of a human hair - they compute very fast, much faster than people who design them! Biological systems provide not only examples, but also tools to use and models to emulate. The attention given to advanced systems must neither obscure how far we are from implementing them nor discourage investigation of early steps. Practical work must begin with what we can make today. Not surprisingly, many proposals for early development goals centre on exploiting natural productive nanosystems to build next-generation systems. Each generation could make a wider range of materials and structures, moving further and further beyond biological models. Recently developed capabilities in the design of novel protein and nucleic acid structures-including simple molecular machines-have opened the door to a path of progressive improvement. Looking toward advanced milestones in a long, multi-stage development program, a picture emerges of a desktop scale factory that converts inexpensive compounds into macroscopic products-for example, billion-CPU laptop computers, or sheets of high-efficiency photovoltaic cells. The factory builds macroscopic products layer by layer from diverse, multifunctional, micron-scale building blocks (a cubic micron can hold a CPU). It places these blocks using programmable positioning mechanisms similar in function to the pick-and-place mechanisms found in modern factories. The blocks, in turn, are assembled from smaller blocks. 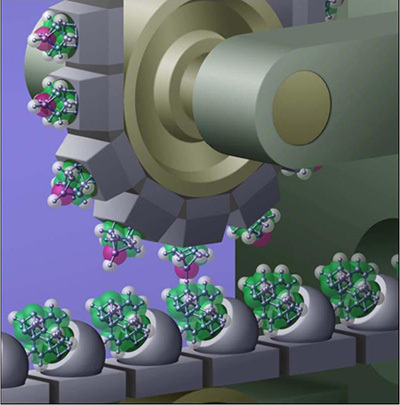 The smallest blocks can be made using fast, simple, efficient mechanisms that do only repetitive operations like the one illustrated schematically below - a molecular mill that builds products with atomic precision by guiding molecular reactions. Some researchers might argue that so-called self-assembly of molecules in solution is a better, fundamentally different way to build atomically precise nanoscale systems. If one considers only near-term results, self-assembly is indeed better, because self-assembly can be made to work today. For this reason, self-assembly is the leading candidate method for implementing early-generation productive nanosystems. In self-assembly, however, molecular building blocks must be designed to fit together in only one way-the building blocks themselves must encode the structure of the ultimate product. Matching surfaces must adhere to each other strongly, yet other pairs of surfaces must bind so weakly to one another (and so strongly to solvent molecules) that they do not adhere. If these conditions are met, spontaneous Brownian motion can assemble intricate machines, and Brownian motion, of course, is available without further development. Biological systems exploit self-assembly, but they use programmable machines to make the required building blocks. Direct, mechanical assembly can build a new design by combining standard parts in a new pattern. We live in a quantum mechanical world: the properties of matter on all scales are consequences of quantum mechanics. Nonetheless, many macroscopic systems can be described with good accuracy by classical models, which are often more intuitive and tractable. Nanoscale systems operate in the borderland of the classical domain, where the applicability of classical models depends as much on the nature of the phenomena as it does on the scale of the device. Many nanoscale electronic phenomena are inescapably quantum mechanical. In contrast, many nanoscale mechanical phenomena can be described well by classical models. Tunnelling, quantized energy levels and quantum interference typically play lesser roles owing to the large masses of nuclei and molecular structures, and at room temperature these quantum effects are usually blurred or overwhelmed by thermal fluctuations. Quantum nanoelectronic systems will doubtless be important products of productive nanosystems and may play an important role in their implementation. It is, however, possible to design and analyse systems in which all the important degrees of freedom are mechanical and are subject to classical analysis with quantum corrections. At room temperature, thermal fluctuations present the chief difficulty in achieving reliable molecular fabrication. Molecular machines can fail because their structures fragment or rearrange. However, with careful design, the barriers to this sort of failure can be made comparable to bond energies, and the room-temperature failure rates can be correspondingly low. Molecular machines can also fail because of transient displacements. The most important case in productive nanosystems is the displacement of a molecular tool during an operation intended to transfer a molecular fragment to a workpiece: this can cause an unwanted bonding transformation. Thermal fluctuations also raise the energy cost of reliable assembly operations. Although they do not directly impose a cost on accurate positioning, they can make bonding transformations fail by enabling the system to exit with a molecular fragment in the higher of two potential wells- that is, still attached to the tool. The simplest way to reduce errors of this kind is to expend energy, allowing a transformation to drop the system into to a deep enough potential well. This dissipates energy into distributed vibrational modes, which quickly thermalize. A drop of 40 kT300 suffices to make the probability of a failed transformation < 10-18. If the steps required to process each atom require a total of ten times this energy, the energy consumed per kilogram of product will be less than half the energy cost of smelting a kilogram of aluminum. This web page is an adapted version of the article "Productive Nanosystems: The Physics of Molecular Fabrication" by Eric Drexler published in Physics Education, v. 40 (4), 2005, pp. 339-346 (with permission from the author and the IOP Publishing). Nanotechnology: Drexler and Smalley Make the Case for and Against "Molecular Assemblers"